SpamTitan Cloud is an award winning Anti-Spam Email Scanning service that is tried and tested. SpamTitan Cloud is built on the same technology as SpamTitan Gateway, SpamTitan’s performance is externally validated each month and it consistently features as one of the best catch rates for Anti-Spam appliances from a host of market leaders. SpamTitan Cloud has a complete feature set that suits any size business. We are proud to offer a complete Managed SpamTitan Cloud service, including all setup, integration, testing and customisation required for deployment in your organisation. As part of this service, we offer preferential rates to our clients, not available by going to SpamTitan directly. To find out more information, or for a quote on this service, please contact sales. 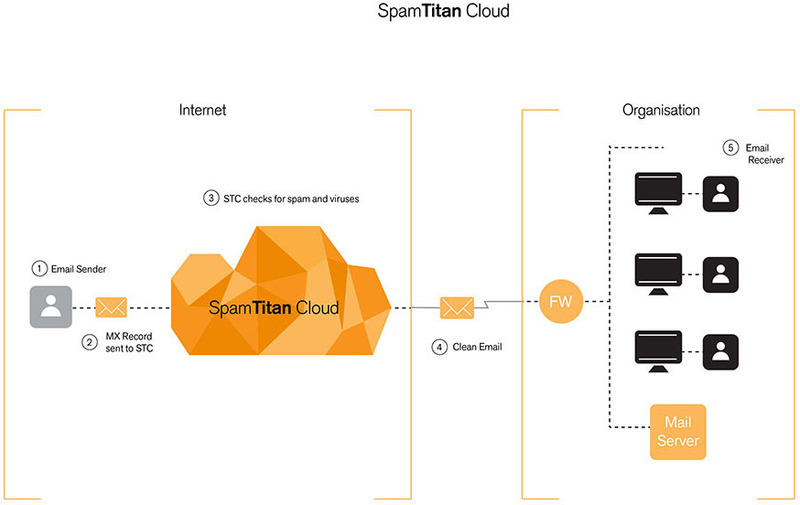 Spam Titan Cloud filters your organisation’s email traffic to stop email spam from reaching your users. The solution guarantees 99.97% spam detection through multi-layered spam analysis including; real time blacklists (RBLs), lists of websites that were detected in unsolicited emails (SURBLs), sender policy frameworks and Bayesian analysis, This coupled with a low false positive rate of 0.03% allows you to rest easy knowing your users never lose genuine email, but are protected from unsolicited email. The multi award winning solution contains double antivirus protection; Bitdefender and Clam AV which serve to block viruses and malware trying to infiltrate your network through email. The solution allows you to whitelist / blacklist sender email addresses meaning you can choose to always allow/ always block mail from a particular email address. Spam Titan Cloud can send a quarantine report to users on a daily or weekly basis. The quarantine report contains a list of emails which have not been sent to the user because they potentially contain spam or viruses. These have been quarantined. The end user can decide to deliver, whitelist or delete the emails detailed in the digest report, with a simple click on the links beside them. The cloud based solution requires no software installation making it simple to set up and manage. There are no management or maintenance over heads as updates and support are fully included in the product. SpamTitan offers a number of Recipient Verification types they are: Dynamic Recipient Verification (DRV), LDAP, list based and specify regular expression verification. Once an email is delivered to the SpamTitan Cloud, it will validate the email address against the mail server thus rejecting fake emails and spam. The Web Authentication settings allows you to control for each Domain what Authentication Method will be used when a user attempts to login. The following authentication methods are supported: Internal (default), LDAP, SQL server, POP3, and IMAP. The support of external authentication modules ensures that when possible users won’t have to remember multiple passwords. All login attempts will be directed to the appropriate authentication server for that domain.